A simple 2.7K 50p/60p mode with low compression. Thats honestly all that attracts me to the GP4 now. Why can't one company make this ? 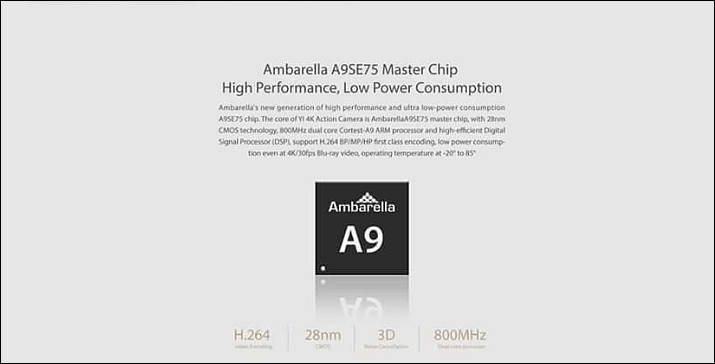 Do not worry, upcoming sensors and chips - http://www.personal-view.com/talks/discussion/14920/ambarella-s5-next-action-cams-will-do-4kp120-and-8kp30#Item_3 will do many things. May be it even will have mode you so wish, and bitrate will be certainly hacked. I hope they improve dynamic range this time... I hate images that look like a cell phone vídeo. It was for the original Xiaomi Yi camera. Built with the new generation Ambarella A9SE75 chip, Sony IMX377 image sensor, 7-layers all glass lens. Records 4K/30fps at 60mbps, 4x the quality of 1080p. YI 4K Action Camera reaches new heights. Customized with a 330ppi high resolution and high-sensitivity retina touchscreen for an intuitive experience. 2.19 inches of Gorilla Glass to resist scratches and daily impact. Viewable from a 160° angle. You won’t miss the perfect shot with the 640*360 widescreen for quick and easy previewing and shooting. Control YI 4K at your fingertips. No extra hands needed. High capacity 1400mAh battery Designed with adventurers and photographers in mind, we use the world’s leading rechargeable 1400mAh high-voltage 4.4V lithium-ion battery from Amperext Technology (supplier of iPhone battery). YI 4K stands by you for up to 8 hours of standby time. Get out there and shoot 4K/30fps video for up to 120 minutes with a single charge. 6-30 seconds video editing, image/video filters and music options. Simple enough for beginners to use, but designed for professional output. You’ll never have to use a computer again! 3.35 ounces of world leading imagining technology. YI 4K’s all-in-one and impact resistance design fits in your pocket and is ready for anything! With new colors and high quality finishing it is not only a camera for shooting amazing photos/videos, but also the fashion accessory you’ve been waiting for. '7 layers all glass lens' and it's still a fisheye? I especially like the "daily impact" and "fashion accessory" features. Though seriously I think I am gonna try one...might even pre-order. For the stuff I do (fishing) the 240 fps at 720p could be really good. In the video comments it says they will be adding a protune-style recording mode. 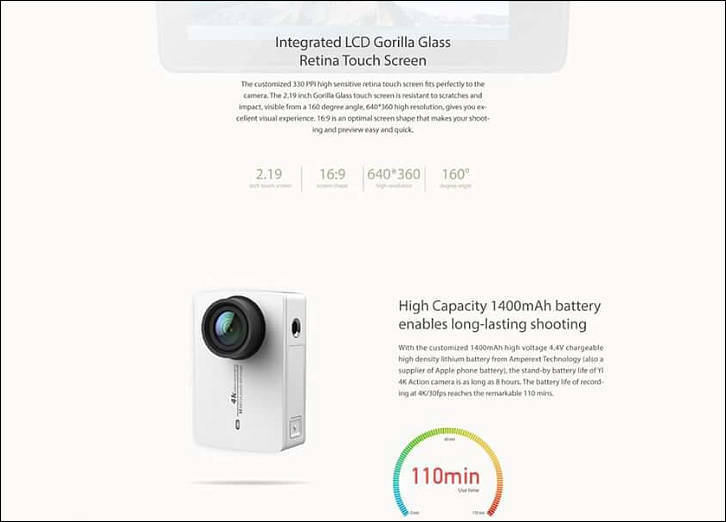 SEATTLE--(BUSINESS WIRE) -- Just in time for Amazon Prime Day on July 12, YI Technology, the leading, international provider of advanced, intelligent imaging technologies, will launch the YI 4K Action Camera, the latest in its successful line of action and home cameras. The new device is the only action camera on the market today that combines 4K30 video recording, up to 120 minutes of recording time and an integrated, high-resolution touchscreen, all at the unmatched price point of $249. Wow, thanks. Need to try it. Still did not get it. Hope to find detailed review on all aspects of this little cam. I do not see anything innovative here: No 4K60p, no HFR beyond 120p, no 2.5K at 60p. And, of course, the stabilization does not work in 4K (neither does the distortion fix or low light). So, this is just a knock-off of the Hero 4 Black, with some nice features (LCD), but indeed at a very good price and the quality in 4K looks good. The Sony FDRX300 (available in Japan) has BOSS stabilization in 4K - that's an innovation. Are you sure? As BOSS is gimbal like stabilization in their video line. Most probably it is juts optical and electronic stabilization. And here is the link to that page, with a diagram of what is going on. Seems like free-floating sensor/lens to me, just like BOSS. And that it works in 4K (which for sure it says it does)suggests that it is purely optical/mechanical - no digital at all. It is very good system. Best stabilizer amount all camcorders.